Olivia has been in the kitchen baking cookies again and since she will be 15 in just a few weeks, her tastes seem to be a little more adult. 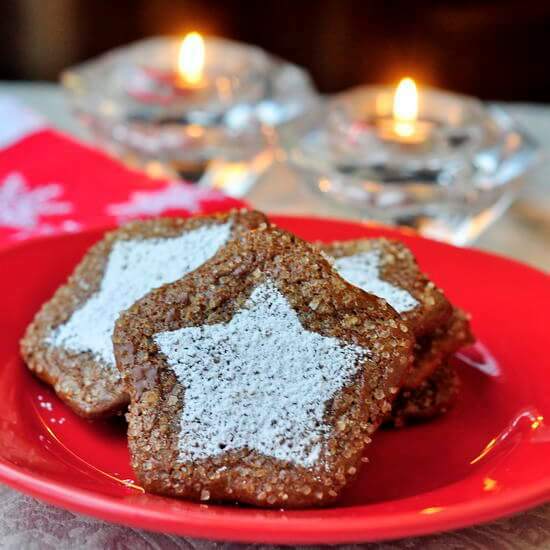 This recipe would make a good alternative to gingerbread for making decorated Christmas Cookies but make a scrumptious coffee break treat at any time of the year. If you need a recipe for Royal Icing, (that’s the kind that dries hard) to use in decorating Christmas Cookies, find that recipe and decorating tips by clicking HERE. Mix together until a soft dough forms, then chill the dough for at least a couple of hours before rolling the dough out on a lightly floured board to about 1/8 inch or 4 mm thick. Cut cookies out with your favorite cookie cutters or cut in diamond shapes before transferring the cookies onto a parchment lined baking sheet. If you are not planning to decorate the cookies with frosting, I recommend brushing on a little egg wash and sprinkling with turbinado sugar. (You can use any coarse sugar or regular sugar in a pinch). This gives an extra crispy, yummy sugary layer. Bake in a preheated 350 degree F oven for 13-15 minutes. Cool cookies completely on a wire rack.